Ken Austin is this week’s featured artist. Ken was one of my first watercolor teachers. I took a class from him at Crealde in Winter Park a few years ago. I remember calling the school and asking for the perfect teacher to take my limited knowledge of watercolor to the next level. The person on the other end of the phone didn’t hesitate in referring met to Ken. 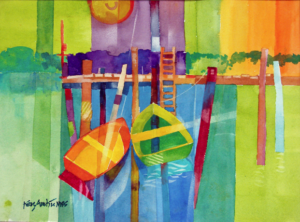 Ken was the founder of the Central Florida Watercolor Society and has been impressing art lovers for many, many years. Taking that class with Ken opened my eyes to a new way of painting. He taught us theory and the importance of experimenting. I consider him to be one of my mentors. I’ve certainly learned a lot from him. When I approached him about writing for my blog he graciously agreed. I asked him to share some details about his art journey. He is still a teacher at Crealde and has a studio at FAVO in Downtown Orlando. The first watercolor I remember painting was when I was four years old. My mother, Betty H. Austin, was an accomplished artist (MFA from Peabody) and during WWII, when my dad was overseas, she would take me with her when she went out on plein aire rambles. She would give me watercolor to paint with and I’d dutifully paint while she did her own thing in oils. I did this even into my teens and so was never afraid to make art. In college, as an architecture student, I took classes in rendering, and one of the mediums taught was watercolor. We had a talented instructor, a professional, and the more I learned about it, the more I liked it. I used it at home summers freelance and in architectural offices when I had a job to make presentations and sketches for clients. By age 19 I was spending summers selling my skills to architects in my hometown and beyond. But in 1975 we moved to Houston, Tx and it was there I saw the traveling exhibition of the American Watercolor Society. It was sponsored by the Watercolor Art Society – Houston (WAS-H) which I joined on the spot and was active in all the time I lived there. It was there I met Polly Hammett, AWS, NWS, who became my teacher, friend and supporter. A great teacher, she took me under her wing and I learned about design in watercolor, watercolor technique, and developed an “I can do it” attitude. We later became studio mates, and remain close to this day. The result of this relationship offered me another learning option; watercolor workshops. At Polly’s urging I took a workshop with Skip Lawrence at the Springmaid Watercolor Workshops in Myrtle Beach, N.C. His incredible teaching skills and his support for my work made me even more aware of the value of design and a deeper understanding of materials, subject, and style. By 1987, when we moved to Orlando, I was involved in finding a new and different expression in my art; something I could love doing and the art audience would enjoy seeing. I continued painting on my own, and joined the Florida Watercolor Society. 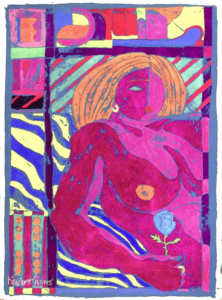 Within a few years I had begun painting my “Big Women” series, using the gouache resist technique. This work was accepted into various national and local shows, winning awards in some. 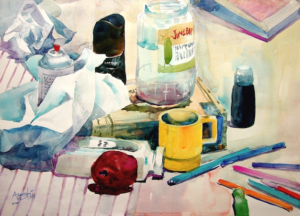 Soon after, perturbed that there was no opportunity for workshops or an identifiable community of watercolor artists in Orlando, I founded the Central Florida Watercolor Society, now numbering around 160 members. In 2009 I began teaching watercolor at Crealdé school in Winter Park, FL. That, interspersed with workshops in Orlando and beyond, has been my main teaching activity in watercolor since . This brief description of the high points of my career with watercolor is, I’m happy to say, still growing and I am still learning. Heather Torres is an award-winning watercolor and acrylic artist from Orlando, Florida.